Archie Comics has had great success with their horror imprint, reimagining their iconic characters as survivors of a zombie apocalypse or exploring the dark roots of Sabrina the Teenage Witch's coven. They did away with the camp for serious thrills and chills. 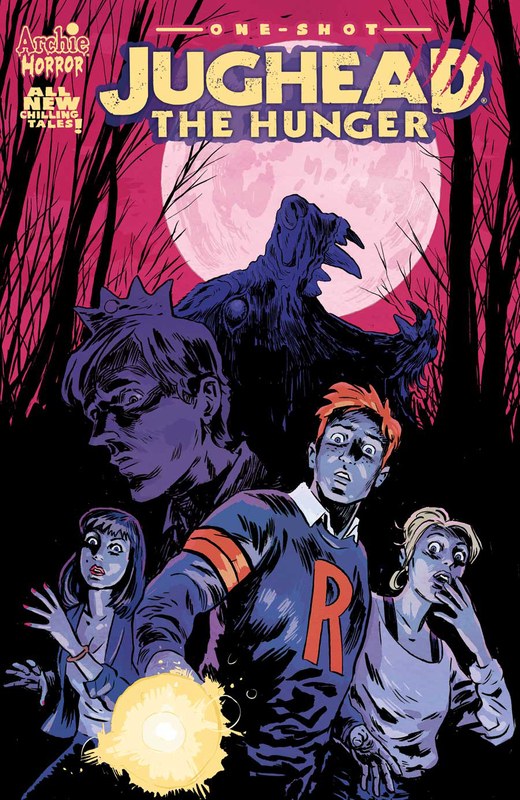 'Jughead: The Hunger' one-shot follows the same sober and bloody path as Frank Tieri and Michael Walsh expose one of Riverdale's darkest secrets. There's a serial killer on the loose in Riverdale and has already claimed the lives of some familiar faces. The opening scene demonstrates just how vicious this killer really is. Elsewhere, Jughead, Archie, Betty, Veronica, Reggie and the rest are watching a horrific scene of another kind. Jughead has almost put an all-you-can-eat restaurant out of business by stuffing his face over and over again. It vividly describes "the hunger" withing the title of the book but what else does Jughead hunger for? As the layers are peeled back some great backstories emerge about not just Jughead but others in the gang. You'll never see Jughead the same again. It's a lot of information to put in a one-shot but Tieri does a smooth job of being concise without lessening the tension once the killer is revealed. In fact, you'll want to see more by the end of the story as it remains open-ended. Walsh's selective color palette and moody panels set the perfect unnerving atmosphere. Designs of the Archie kids are fresh and far from the classic comics obviously but Betty Cooper stands out as a version of another famous television heroine whose name also starts with a "B." The sequence of the monster's transformation was especially impressive. Walsh gives this monster movie the tone and sheen it needed. What Tieri and Walsh have done with 'Jughead: The Hunger" is auditioned for an ongoing or limited series whether they know it or not. I want more. I want more Jughead horror stories as he travels the country like Bruce Banner did on TV's "The Incredible Hulk. "As a one-shot, this is a solid story with some surprising devilish twists. It's a nice appetizer to hold us until "Afterlife with Archie" returns.